Varnishlog is an essential tool to measure the performance of your Varnish cache. Why add a reverse caching proxy like Varnish in front of your application, if you can’t analyze how it performs or behaves? This blog post is an in-depth tutorial on how to use the varnishlog tool to retrieve Varnish Shared Memory Log information. The goal is to filter the output and turn it into meaningful output that gives insight into the behavior of your Varnish cache. Follow along for an in-depth tutorial. Use the Table Of Contents if you want to read specific sections of this long blog post. 10 Why didn’t Varnish serve this request from cache? Varnishlog is a utility that reads the contents of the in-memory log that Varnish provides. This log is often referred to as the Varnish Shared memory Log (VSL). Because it is stored in memory, it’s not a persistent log. The varnishlog utility offers you a way to have a look at what’s currently happening within your Varnish instance. By default, the output is grouped by transaction and is tag based. A tag has a value and varnishlog allows you to query and filter the output by tags and values. Have a look at the man pages for full reference about the usage of the varnishlog binary. The varnishlog is just a utility, an interface. The actual logs are generated by the varnishd program. By default the VSL is 81 megabytes in size. However, the size VSL size can be set to a custom value by adding the -l option to your Varnish startup options. The Timestamp tags identify the starttime and endtime of the request. These are unix timestamps. The ReqProtocol tag indicates which version of the HTTP protocol was used. This is only an extract. An actual transaction contains a lot more information. We’ll dig deeper throughout this blog post. But you’ll find the full reference for VSL on the Varnish documentation site. Transactions are items of work. Every transaction in the log is identified by a transaction ID (VXID). Log lines that share the same VXID belong to the same transaction. A session refers to the TCP connection that the client makes to the server. When keep-alive is supported, one connection can process multiple requests. You see the Begin tag for the different transactions in the log output. You’ll notice the different types of transactions, the parent and child VXIDs, and the reason why this is transaction is occurring. It may seem weird that a transaction that occurs later in the flow, is displayed first. Because of the dependencies between transactions, there is some kind of encapsulation going on. The image above illustrates this quite nicely: transaction 3 is shown first, because it is the inner most transaction in the flow, encapsulated by its parent transactions. By default, transactions are grouped by their transaction ID (VXID): transactions are displayed in their entirety and separately, including sessions, and the different kinds of requests. This results in independent transactions with limited context about their correlation. VXID: group by varnishlog transaction id. This is the default behaviour. Let’s illustrate these grouping modes with an example. 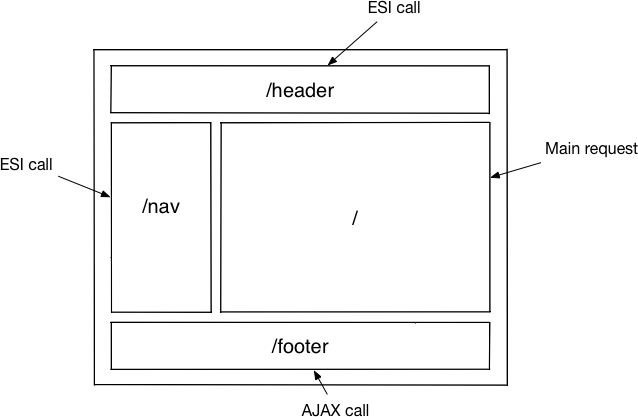 The diagram below show the content composition of a website that has a header, a navigation, a footer, and the main content block. The homepage also loads the /footer resource through an AJAX call. This command displays the start of transactions, the request URL, linked transactions, and the backend request URL when a backend call is made. As you can see, there is no grouping, no hierarchy, an no indentation. Thanks to the Link tag, we know which requests are triggered by what session, and which backend fetches are triggered by what request. But it’s not really intuitive. When you group transactions based on the request using varnishlog -g request, session information will be omitted. When you perform raw grouping using varnishlog -g raw, every log record is a transaction on its own. In this case there is no correlation between log records. 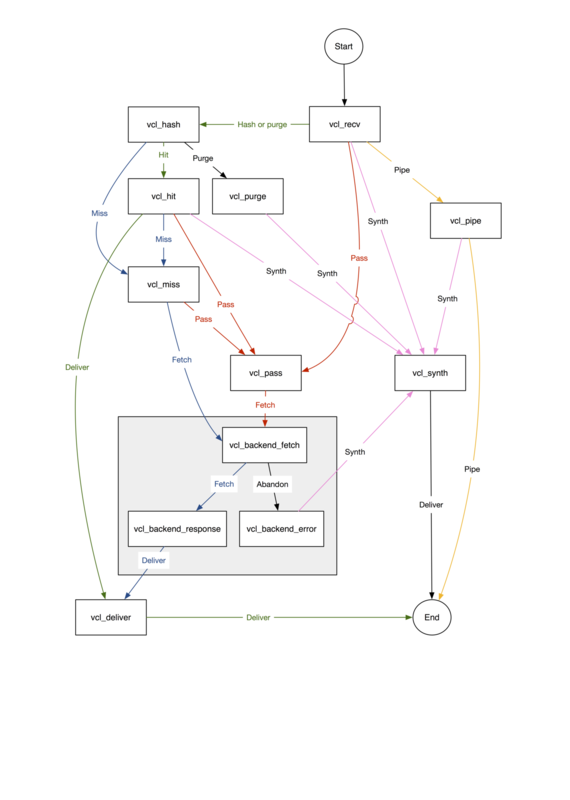 Shared memory logs only provide meaning when you understand how they represent the VCL flow. Varnish uses the Varnish Configuration Language to extend its default behavior. It is essential that your understand the behavior, but that’s material for a blog post on its own. Basically, you should understand that Varnish receives requests and tries to return the cached response from memory, rather than fetching it from your backend. The differente stages of the flow are identified by the corresponding hook names. These names are useful to know when you come across them in the memory logs, as they provide context. So far we’ve talked about loglines, about the correlation between log lines and transactions, and the correlation between transactions. In the previous examples, we already hinted towards tags. I showed you some basic tags like Begin, Link, ReqUrl, ReqHeader. Although these tags were useful in the context of transaction identification, the output gives little meaning from a broader perspective. It’s about time we introduce some more tags and group them according to their meaning. The full reference can be found on the Varnish documentation website. Request tags are used to identify the different bits and pieces of an incoming HTTP request. ReqHeader: a set of request headers that are passed. In this case we’re setting up a connection on the localhost to a webserver that is running on port 8080. The local port on Varnish that is used is port 62552. The backend is identified as “default”, and was loaded at boot time. Later on we’re closing the connection to that named backend. In one of the next segments, I’ll show you how to monitor backend health using Backend_health tags. There are other backend tags available, you’ll find them on the Varnish documentation page. Again, there’s more, but I won’t cover them all. It will come as no surprise that the backend response tags are almost identical to the response tags. A backend response object contains payload and headers that were returned by the backend. The value of a backend response will be stored in a cache object, and later on copied into a response object. VCL_call: contains the name of the VCL method that is being executed. This method represents a state in the VCL flow. VCL_return: logs the VCL method termination statement. This indicates which decision the VCL makes and implies a transition to the next state. There are plenty of other scenarios, but a hit and a miss are the most essential scenarios. The VCL_call and VCL_return tags are, in my opinion, the most useful tags. They provide meaning and context. Without them, it’s sometimes hard to determine what happened to certain requests or responses. Use them in conjunction with request and backend response information. The Varnish Shared Memory Logs also contain some tags that are specifically cache related. The ExpBan tags is used when the VCL bans an object from cache, a log line with the ExpBan appears containing the VXID of the parent transaction. The HitPass tag is used for log lines that are negatively cached in the Hit-For-Pass cache. This is caused when the vcl_backend_response method inspects the backend responds and decides the response cannot be cached, for a variety of reasons. This means the decision not to cache is cached in a special Hit-For-Pass cache. This avoids unnecessary request queueing. The log extract above indicates that the response for the /footer resource was negatively cached. For the next 120 seconds, Varnish will bypass the decision whether or not to cache, and serve the data directly from the backend, regardless of other criteria. If the TTL is set based on HTTP response headers, the value for the first column is RFC. If the TTL is set by VCL, the value is VCL. The effective Time-To-Live is stored in the second column of the log line. If the VCL has specific grace, or keep values, this is added to the Time-To-Live, and gives it some extra leeway. These values are added as the third and fourth column. The fifth column contains the current timestamp. If you would add a custom Age header to your HTTP response, you would in fact mess with your Time-To-Live: the amount of seconds that is stated would be deducted from your TTL. In the example below the response contains an Age=3 header which makes the object 3 seconds old from the go. The Begin talk isn’t really new to us, I mentioned the tag earlier in this post. This tag indicates the beginning of a transaction, staging which kind of transaction it is, to which parent transaction it belongs, followed by a bit more context. As mentioned before: the transaction is either a session, a request, or a backend request. Backend requests could be regular requests, or ESI requests. If you just want to know how long the full transaction lasted, the very last occurrence of the Timestamp in the request suffices. The other occurrences are useful if you want to know where a possible delay happened. At this point, we have figured out how transactions work and which tags can occur in our log lines. When you run the varnishlog command, the unfiltered output tends to get very noise on a system that gets a reasonable amount of traffic. Let’s face it: most of the time, you don’t need to see all the data. You’ll filter the output, and only display the relevant tags for your use case. Including multiple tags can either be done by adding multiple -i parameter, or by passing a comma-separated list of values. A header that occurs a lot in our output is the request header. Quite often you don’t want to have all the request headers in your output, just that one will do. The -I option allows you to include log lines by regular expression match. What we’re doing is including the ReqUrl tag, and including all ReqHeader tags that match Accept-Language. Similar deal here, but for exclusion. Image you want to see the HTTP response headers that will be returned to the client, but exclude the custom headers that start with an x- or X-. varnishlog -i RespHeader,ReqUrl -X "RespHeader:(x|X)-"
Yet again, we’re combining multiple filtering options to get the ideal output. So far we’ve been filtering the output, and only displaying log lines that match specific tags we’re interested in. The good thing is that we’re reducing the amount of output we’re getting by doing tag-based filtering. But that still means all transactions are processed, and tags are stripped off. It doesn’t allow us to reduce the amount of transactions we’re getting. That’s where VSL queries come into play. The -q option gives you the possibility to query for transactions that match patterns and values. The VSL query language can do this for you. The record selection criteria can be tags, taglists, tag prefixes, or even fields for tags prefixes. You can even decide at which transaction level you wish to query. varnishlog -i VCL_call,VCL_return -g request -q "ReqURL eq '/'"
This command returns the VCL_call and VCL_return values for the homepage. We notice the homepage is served from cache, which is good news! varnishlog -i ReqUrl -q "VCL_call eq 'MISS' or VCL_call eq 'PASS'"
varnishlog -i ReqUrl -I "Timestamp:Resp" -q "Timestamp:Resp > 1.0"
This command displays the URL, and the response timestamp for all requests that take longer than 1 second. The query looks for the Timestamp tag, and takes the second column for any occurence that has Resp as the prefix. If that value exceeds 1 second, it gets reported. Throught this article, a lot of useful varnishlog command line options were covered. There are other options you’ll probably never use, but I want to mention some of them anyway. By default we read the tail end of the log, because this contains the latest information. If you add the -d option, varnishlog will start at the beginning of the log. This means you’ll see older log items that are sent to stdout. This could be useful to measure certain assumptions on a larger sample. Varnishlog prints a continuously updated list of log items, or dumps the full log to stdout, depending on your output settings. But varnishlog has the command line options to redirect the output to a file. This command will make varnishlog run in the background and store human-readable logs in /var/log/varnish/custom.log and append data. The PID of the daemon is stored in /var/run/custom_varnishlog.pid. When you run multiple instances of Varnish on a server, the varnishd process will use the -n parameter to name the instance. Varnishlog can use that same option to identify the Varnish instances who’s shared memory log it should examine. All I’ve been talking about is varnishlog. It’s a great tool, but it just spits out logs. Varnishtop on the other hand, uses the Varnish Shared Memory Logs to create a continuously updated list of the most commonly occurring log entries. It’s basically like the top command on Linux, but for Varnish. You can use all the filters and queries that varnishlog and create meaningful output. varnishtop -I reqheader:Accept-Language -q "ReqUrl eq '/'"
Why didn’t Varnish serve this request from cache? Each of these stages have their own set of criteria. The shared memory logs will help you figure out why Varnish didn’t cache your page. This is the default behavior of the VCL in Varnish. If you extend the behavior with custom VCL scripting, you can change this rules and still decide to cache requests that were otherwise not cacheable. When Varnish receives an HTTP request from the client, it will check whether or not it is stateless. By default only stateless request are deemed cacheable. varnishlog -i "Req*,VCL*" -x ReqAcct,ReqStart -q "VCL_call eq 'PASS'"
We’r specifically looking for requests that were passed to the backend. In the output we notice that a cookie was set. That’s why the page cannot be cached. Although there’s no cookie, the request is still passed to the backend. That’s because the request was sent using the POST method. Post calls aren’t cacheable, because they imply a state change. Again, the page is not cached. That’s because there’s an Authorization header. Authorization implies state, and is not cached by Varnish. When a request is considered cacheable, but the object is not found in cache, a backend fetch happens because of the miss. When the vcl_backend_response method receives the response from the backend, it examines the headers for non-cacheable values. If it turns out that the response isn’t cacheable, Varnish will mark it as Hit-For-Pass for the next 2 minutes. The following command lists URLs, VCL behavior, and backend response information for transactions that contain a HitPass log line. What does this mean? The HTTP response for the /my-url resource was not stored in cache, because it did not comply to the criteria that are validated in the vcl_backend_response method. In our case the Cache-Control: max-age=0 header that was returned by the webserver causes Varnish not to cache the object. It is marked as Hit-For-Pass, and subsequent requests are immediately sent to the backend. We can retrieve this information from the BerespHeader, but the last field of the first TTL occurrence also show that the max-age or s-maxage value is zero. Another reason could be that a cookie was set in the backend. Varnish doesn’t cache responses that set cookies, as they imply state changes. The first occurrence of the TTL tag shows that there is a valid max-age or s-maxage value. The value is 10, and this is also reflected by BerespHeader Cache-control: s-maxage=10. However, the Hit-For-Pass still occurs, and that’s because of the cookie that was set. This is reflected in the logs by BerespHeader Set-Cookie: myCookie=bla. If you set the Time-To-Live to zero in your Cache-Control header, or you add private, no-cache, or no-store expressions to your Cache-Control header, the object will not be cached. This also applies to an Expires header that was set to a time in the past. The same thing happens when you set a cookie. These are the most common reasons why Varnish doesn’t cache objects where the request look like it was cacheable. By now, you should realize that the Varnish Shared Memory Logs (VSL) are tremendously useful. You can hook into what’s currently happening on the server. Both the varnishlog and varnishtop binaries are at your service to provide the necessary insight. Both utilities have filter options and a query language to display the exact information you need. If you really want to leverage these tools, you should have a decent knowledge of the internal flow within Varnish, the default VCL behavior, and the VCL methods. Any custom VCL code that your Varnish instances uses, will also influence this behavior. 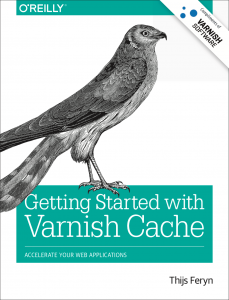 If you want to learn more about Varnish, I suggest you read my book. It’s published by O’Reilly.